Scroll down to see our selection of Blood Pressure Monitors for sale. Blood pressure monitors allow physicians and individuals to monitor changes in blood pressure. 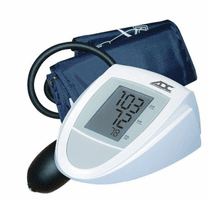 We sell a variety of blood pressure monitors that can automatically give you a reading. Our blood pressure monitors also come in a semi-automatic and manual style to meet everyone’s need. Blood pressure monitors, also known as a sphygmomanometer, is a device used to measure blood pressure. Blood pressure monitors are made up of an inflatable cuff to restrict blood flow, and a mercury or mechanical manometer to measure the pressure. People with high blood pressure and or taking heart medication often use blood pressure monitors. Digital and automatic blood pressure monitors allow individuals to check their blood pressure between doctor’s visits at home or on the go. Manual pump blood pressure monitors are used in conjunction with stethoscopes..